LOS ANGELES (AP) — When bracing for 120 degrees, it's all about the water. Drinking it, splashing in it to stay cool, and drinking it some more. A lot more. That's what officials were urging and residents were planning Friday as a potentially record-shattering heat wave started enveloping the Southwest United States and threatened to bring temperatures of more than 120 degrees to parts of Arizona and California next week. People in places like Palm Springs and Phoenix are used to seriously high temperatures, but 120 degrees becomes all the talk around the water cooler. And with the health dangers of heat and dehydration, that's where authorities hope they keep coming back. Teresa Flores in Phoenix said she will make sure her two sons and daughter stay hydrated. "Water, water, water, water," Flores said. "So even when they think they're not thirsty, they're drinking water." Jennifer Vollmann brought her 2-year-old daughter to a public pool in downtown Phoenix, where the temperature hit 108 Thursday. With 121 degrees predicted Tuesday, "we'll be here, she'll be in the pool," Vollmann said as her daughter ate a blue ice pop. Strong high pressure building over Western states is bringing the hot onslaught. 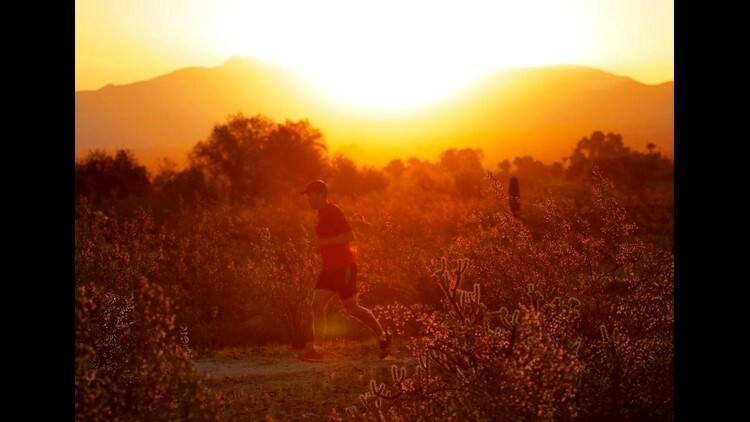 Officials warned of excessive heat across southern portions of Arizona and Nevada, and throughout the 450-mile length of California's Central Valley. Almost the entire Golden State was predicted to simmer above normal temperatures, easing just short of the coast. With up to 122 on the horizon, Palm Springs will have cooling centers in community centers and libraries, and Phoenix and nonprofit groups are planning water stations to help the homeless and others. Palm Springs has soared above 120 several times, most recently hitting 122 on June 29, 2013. The National Weather Service in Phoenix said the last time the temperature topped 120 was 1995, at 121. The record high is 122 degrees, set on June 26, 1990. In the Arizona desert near the U.S.-Mexico border, the heat can be so deadly that the Border Patrol reassigns agents and resources to areas that are especially dangerous for immigrants. "It is physically impossible for the average person to carry enough water to survive several days of walking through the desert," the agency said in a statement. The area saw more than 1,400 rescues and 84 deaths last fiscal year, according to statistics provided by the agency. Through April, agents in the Tucson Sector have rescued 160 people and reported 14 deaths. Las Vegas and nearby cities also are preparing for the first heat wave of the season with extra cooling stations. Tuesday's high was expected to hit 115. With the three-day outdoor Electric Daisy Carnival music festival kicking off Friday, organizers used social media to encourage attendees to stay hydrated. It was providing free water during the nighttime event, which has drawn more than 130,000 people in past years. In California, forecasters said prolonged heat would make snow melt faster in the Sierra Nevada, where massive winter storms coated towering peaks after years of drought. Waterways could flood, with vacationers warned to be cautious near water and avoid camping close to streams. Camp counselor Sabrina Chu, 17, said she and others in San Francisco were having kids drink lots of water while playing outdoors. The city was expected to have a high of 82 Sunday, well above the normal upper 60s. "Compared to other places in California, the Bay has pretty consistent weather, so this is unusually hot for the area," Chu said. In Southern California, inland valleys, mountains and deserts would likely bear the brunt of the heat wave. Cities such as Redlands and Fontana east of Los Angeles planned to use community facilities as cooling centers. Back at the pool in Phoenix, Vollmann sounded a note of optimism about temperatures "cooling down." "It'll be 110 soon," she said. Associated Press Writers Clarice Silber and Angie Wang contributed to this report from Phoenix. Sally Ho and Regina Garcia Cano reported from Las Vegas. Linda Wang contributed from San Francisco.